Editor’s Note: This excerpt is part of InVision’s Design Genome Project, which looks at what powers great design and highlights more than a dozen companies across eight industries so far. A hybrid approach to org design, which is common in large enterprises, blends multiple organizational models and runs different models in parallel. In hybrid structures, an organization might position designers in a temporary cross-functional team to work on a focused project with a clear deadline. When they’re done, they return to the centralized design team. Design at the top of Intuit: Chief Product and Design Officer Diego Rodriguez was brought on in 2017 and reports to Chairman and Chief Executive Officer Brad Smith. End-to-end structure: The Intuit team is structured without a division between product and marketing, so that experiences are more seamless for customers. We’ve purposely structured ourselves so there’s no line between product and marketing. When you’re selling software as a service, a lot of the separations of what was marketing and product come from more traditional business models. That’s not how our customers experience what we produce, so we made the call to purposely structure teams end to end. Another common hybrid model strategy is to distribute designers in cross-functional teams but pull them back together for design reviews, stand-ups, and fireside chats, which helps designers maintain peer connection even when isolated teams are dominated by engineers. Of the Design Genome Project’s 15 highlighted companies, 36% work in a hybrid org model while another 36% are centralized and 29% decentralized. Many large companies position the design system team as the hub of design culture to which embedded designers return for discussion about creating a unified customer experience across platforms and products. Pros: Provides flexibility to tailor org structure to meet the immediate needs of the teams and the organization. Cons: Hybrid org structures can get complex. It can be hard to operationalize process when teams are organized in diverse ways. Intuit has a unique hybrid structure; it is not one design organization, but rather federalized among the product teams on the consumer and small business side. This helps ensure that the designers working on those teams have a strong connection to the users of the product. They also aren’t afraid to experiment with different structures to optimize relationships as teams grow and shift. Our organization structure is very unique, and there are always optimizations we’re looking at. In a lot of companies, goals change every year. We develop our big bets that we’re going to invest in to achieve those goals, and with that, you have to really look at your org structure to make sure it’s optimized to achieve those goals. We’re always tweaking. In addition to experimenting with structure, assigning more than one designer to a team where possible gives them the ability to overlap and learn from each other. We talk to designers over at Facebook, Airbnb, Uber, and often when they assign a resource they just have a product designer. A lot of our visual designers have a lot of appetite to learn more interaction design and vice versa. We’re also getting to a point where we’re trying to curate our design system, to make sure things like buttons, etc. are universally consistent. 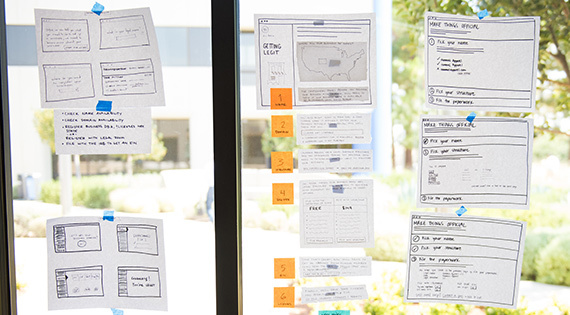 Find out more about Intuit’s design system, tools, and process.